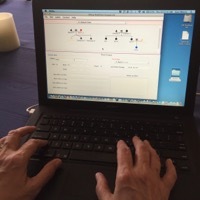 SILKin helps field workers analyze and document the kinship system in a new language. 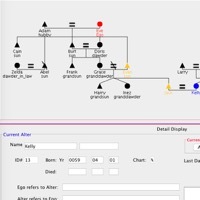 SILKin lets you collect data by drawing Family Tree Charts with genealogical data (name, birth/death dates) and the kin terms used to refer to and/or address the current Ego. It helps you analyze your data by displaying the patterns of kin terms on a chart, noting possible erroneous data, and suggesting when some kin terms might be synonyms or umbrella terms. It can format a standard report about your context. Collecting data about a kinship system is intuitive. You draw family tree charts on screen. Supply as much or as little genealogical information as you like. Each chart has one person designated Ego and another as Alter. Supply the kin terms that Ego uses for Alter and vice versa. View the graphical pattern of the kin terms on your charts. Ask SILKin to search for possible errors in your data, synonyms or umbrella terms. SILKin can suggest definitions of your kin terms, point out similarities to known kinship systems, and suggest the best data for you to gather next. The Help system has extensive documentation of all SILKin features. A series of 14 videos discusses the strengths and weaknesses of SILKin. They demonstrate its use and explain the underlying concepts and terminology. "I have been using this software since the first version was released. SILKin not only provides a means of charting kinship data, but also analyses it, thus fulfilling a much-needed niche in kinship software. Having a good understanding of a society's underlying kinship structure and how people employ kinship terminology is indispensable for good translation; SILKin helps you do this!" Sharon Merz, SIL anthropology consultant working in West Africa. SILKin is a Java application. It runs on Windows, Mac, and Linux machines. Your computer must have a Java Runtime Environment (JRE) that is available free here. The Windows Installer automatically verifies you have the JRE, and loads it if necessary. If you have data in a genealogy program that supports the GEDCOM standard (most do) you can import a family tree chart into SILKin. You still must input the kin term data, of course; genealogy programs do not capture that.